Get ready for work or play. 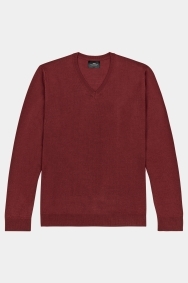 Made in Italy from a mix of acrylic and ultra-warm merino wool, this Moss London jumper in vibrant red allows you to introduce eye-catching colour to an outfit in seconds. 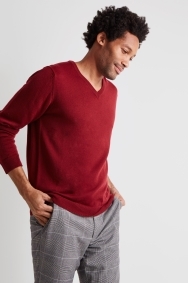 The shirt and V-neck combination is a classic, so go ahead and use this sweater to expand your smart-casual options. Being machine washable, it’s also a great low-maintenance choice. Slip on over a simple white or blue shirt to liven up your workday look. Keep things smart with a skinny tie to compliment the jumper’s profile, or open up your top two buttons to channel a more relaxed vibe.